Hand shaped by Professional long boarder Rasty (Cesar) Moriera in Montanita Ecuador. At only 31 he is already a legend. Unmatched for his creative energy he gives every balsa board a shape that simply blows others out of the water. Not resting on the laurels of his own designs, he innovates with board shapes researched when competing at heavyweight long board comps, such as the Huntingdon Beach Pro, (3rd position 2005) and the Latin Pro (Winner 2003). 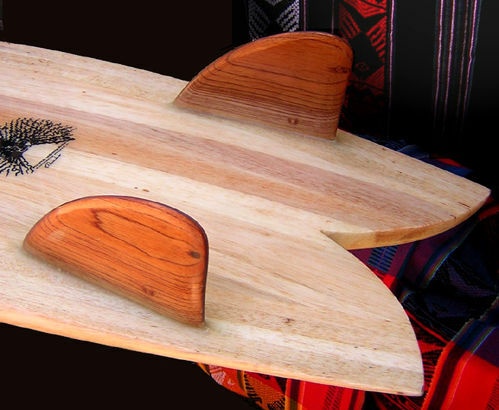 Fourteen years ago he started shaping balsa wood surfboards, the reason he will tell you, while sanding a blank and looking to the sky, is that planet conservation and traditional soul surfing have always been in his heart. 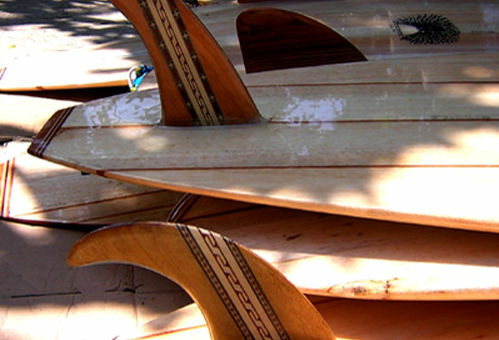 All the surfboards are made of solid kiln dried balsa wood from family managed forest plots. Their balsa trees reseed and join the rich ecosystem and can be cut in just eight years. 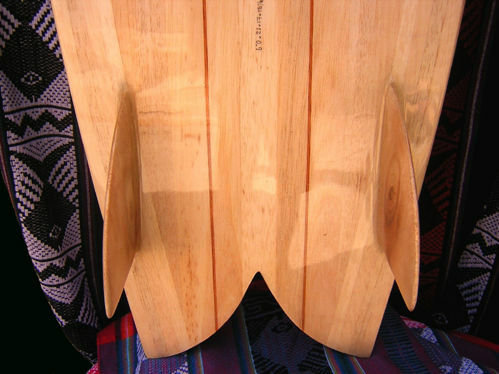 The boards are shaped and concaves and vs sanded by hand, relying on RastyÂ’s eye for perfection not computer shaping machines. Full length balsa wood construction means they are very strong, so a light 4 oz polyester glass was applied, the long boards are all gloss finished, however the fish and egg are matt. Hemp fibre instead of glass is a great ecological alternative, but its colour covers up the beautiful balsa wood grain, making it appear an ordinary buff coloured board. The cooperative is currently experimenting with retting hemp to become transparent and plant based resin, the latter looks like becoming a reality very soon! FREE Creatures Of Leisure Travel bags with each surfboard! Leashes, wax and fins at wholesale prices - just let us know what you want! Delivery to any where in England £40 - other destinations arranged no problem. 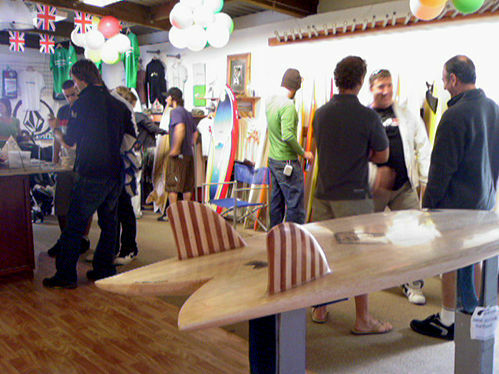 Other models and discounted balsa surfboards are in the Gallery in Devon. Please do not hesitate to enquire and make an appointment to see Tamzen. The Balsasurfers Team Photo!! 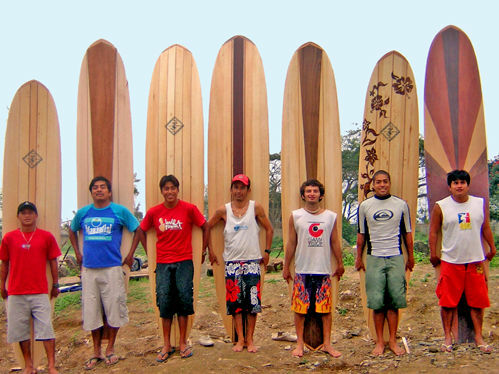 A selection of boards direct from the team in Ecuador to the UK gallery - come in and see them for yourself! 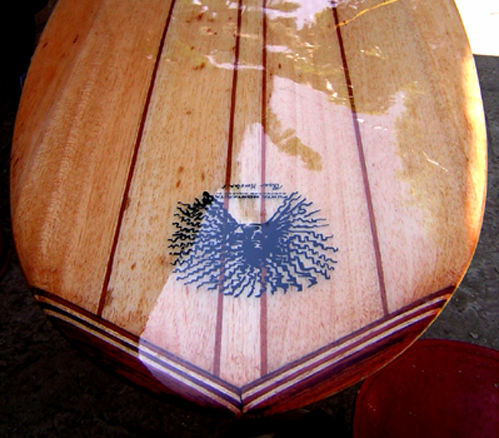 Balsawood surfboards have many benefits to you the surfer and the environment too. Here you can clearly see that while many balsa surfboards are used for Longboard shapes, they are also made for shortboards that, with the right surfer in the right wave, can be as high performance as many other foam-based boards. The deck design uses 4 natural wood veneers, (Balsa, reclaimed Mahogany, Red Cedar and Ochoa) which takes weeks to inlay. Wraps to an incredibly neat line down the rails where the belly shows the solid balsa board construction. Quite simply the Master. Solid balsa with concave nose, 50/50 rails get sharper near tail. Flowers designed by hand by burning the wood with a soldering iron. 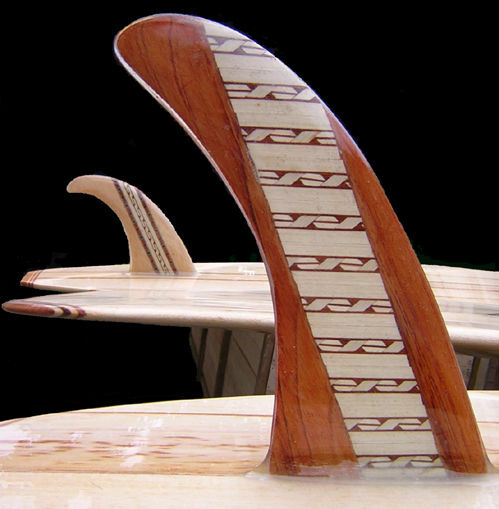 Cedar veneer stripe with inlay border solid balsa, built for beauty, longevity and to glide the ocean in the tradition of surfing legends. Reclaimed mahogany veneer with inlay border colours the solid balsa deep chocolate between the two cedar stringers. Pacifying Pacific Gods with deck design of a mythical condor within the Inca Â‘ChacanaÂ’ cross. Miles of beauty and style, cruises waves miles beyond the line up. Only weighs 9¼ lbs with two central cedar stringers. A semi progressive board for all types of waves, light to carve with a speed that will trance you out. Classic hotdogger with 4 stringers for strength, like its namesake perfect for a girl to carry under her arm, in any hands its bound to become a legend. A traditional master wave catcher with 4 stringers and the belly design the Nazca Condor, will keep flying over chop and down green faces. Deck design using 4 natural wood veneers like the Wooden Master. Art as a surfboard, surfing it is art, for a wall hanging and hanging ten. 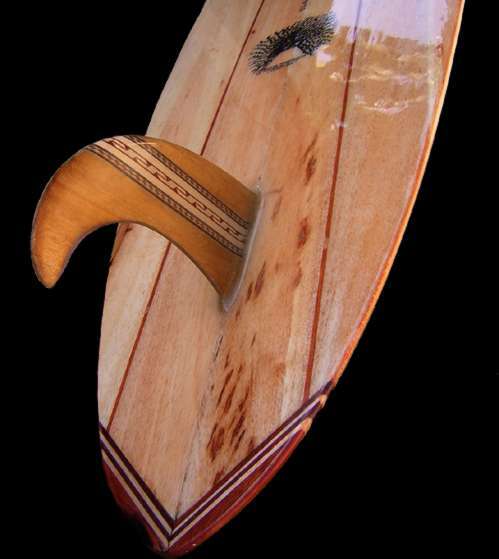 A great little mover, three fins for easy turning and greater control, perfect for surfers progressing from a minimal. For those setting out or surfers with a little experience this board is buoyant, easy to control and will last a lifetime. Weighing only 9 ½lbs its easy to handle and take down the beach. Retro style fish with double stingers that narrow the tail, rides over chop, with ease and incredible speed, perfect for all conditions and suitable to travel for bigger surf. Skip Fry inspired design, cutting the length down but keeping the width. Get into short board tricks with stability and ease. Perfect combination of retro and short board features. Single stingers narrow the tail for less drag and the flat shape floats the white water to cut back time and time again. One off design that's totally radical. Perfect to take traveling, to surf any wave in any conditions knowing its strong and the experience unique - is reason enough! Comparable to foam in weight, this board has a concave vee in the tail, it is suitable for surfers looking for a balance of retro and performance. Great for those used to riding long boards as the width is the same, the sharper nose and concave features will ensure this is a totally new experience, one to get hooked on in waves of bigger sizes.